So, it seems the Scott Brown story won't go away. The story of Scottish football really isn't big enough for the newspapers that are out there and they try to create an agenda that can run for a few days and can cause a bit of unrest. It gets reaction from supporters, it gets letters pages going, it gets the back page the following day because there's reaction. It doesn't affect me but I know it affects our supporters. Why do I speak to the press? Really to talk to our fans - that's the only reason that I talk to the media. If it were down to me solely, I would probably end up doing all our media stuff to our supporters through mediums like yourself (Channel 67) and Celtic View (the club's official magazine). Maybe there's a proportion of our fans who don't have access to Channel 67 or have the opportunity to buy the View, and their only knowledge of Celtic Football Club is through the daily newspapers. That, in my mind, is why I give the courtesy to talk to the newspapers. I've spoken to the last two Celtic managers, who tell me, 'don't get over-concerned about it because it's never personal - every Celtic manager gets that'. I do get to hear these stories - the Scott Brown story this week, which did need addressing of course because it was a total untruth and had no substance to that whatsoever. People just can't make stories up and write them: it should be allowed to happen, which is why the club are taking action, I think. A fairly clear indication that he thinks the tale was entirely fabricated. Also a fairly major hint that his views on the free media wouldn't be out of place in a meeting of the Politburo in Khruschev's Kremlin. Scott Brown continued to insist yesterday that he was told he can leave Celtic. The SPL club went public to deny Record Sport's story that revealed Tony Mowbray informed the midfield player he could be sold during the January transfer window. But information given to us made it clear Brown believes his days at Celtic Park are numbered. We stand by that information and our source, who is well known to Celtic. Yet, on the Parkhead club's official website yesterday they branded our story as "erroneous and without foundation." The truth is that before printing the story it was read out to Brown. And there is no question, no doubt at all, Record Sport's piece was endorsed by him and his reaction included. He knows we reported accurately a story which has been the talk of his Celtic team-mates at their Lennoxtown base. In fact, even yesterday afternoon Brown was still adamant he'd been told he could leave. Someone has been economical with the truth, but Record Sport's conscience is clear. It's now a matter for Brown and Celtic. I still think this has no chance of ending up in court. I still, for what it's worth, think that there's more to it than meets the eye. Certainly there's more to it than Keith Jackson plucking quotes and stories from thin air. And I'm far from his biggest fan or the biggest fan of his newspaper. But there was a couple more hints from Mowbray that this is a hardening of his attitude. He noted that his experience of the media was completely different with Hibs. If he was naive enough not to realise that Glasgow was going to be a little different then he's found out now. Secondly, I wrote yesterday that there was a circling of the wagons inside Celtic Park. Mowbray has run with that theme today. Note also how he tries to pull the fans into the conspiracy. "It's us and them," he seems to be saying, "are you for me or against me." There are problems with this tactic. For a start some of the fans have been as, if not more, critical of the manager than the press. And, no matter how much we'd all like to think they might, the press are not going to disappear. Speak to them, don't speak to them but they'll still be watching you. The most telling quote of all is that Mowbray has spoken to his predecessors. Press and fans alike may not welcome the guiding hand of Gordon Strachan making a return. But the new man has found out very quickly the lesson that seemed to dismay Strachan so much: a great job, yes, but you've got to put up with a lot of crap to get anything done. So where are we? Still no court case likely. And confirmation of my conclusion yesterday that there's going to be no more Mr Nice Guy from Mowbray. An attitude that still needs results to be anything but a snarling mess. Oh, and I wouldn't bet on Scott Brown or Tony Mowbray still being around this time next year. 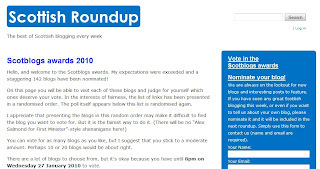 The good people over at Scottish Roundup ("The best of Scottish blogging every week" - including me last week) have put together the Scottish Blog Awards. There's some cracking blogs included in a lengthy list (142 blogs were nominated) and I'm glad to say that The Scottish Football Blog is there as well. I think there's going to be categories (I'll be in Sport presumably) but at the moment the long list appears as is. So feel free to visit (they deserve it - it must have been a real labour of love to put it all together) and cast your vote. Obviously if you'd like to vote for me that would be swell. If not there are some cracking blogs to look at including some of my own favourite football blogs. You've got until 8pm on Wednesday the 27th to have your say. I think the voting is some kind of Strictly Come Dancing type public vote/judges vote hybrid. Your understanding for sticking with this non football post is appreciated with apologies. Sniping at the gutter press? When I heard that Celtic were considering legal action against a news outlet for they what considered to be an erroneous story concerning Scott Brown I immediately trawled through Google News. Now he's a good player and we all hope his recovery can spark a return to his best. But, seriously, the Nobel Peace Laureate and leader of the free world? I'm not qualified to judge such things. But I've got a feeling most women who chose to voice an opinion on such things would judge Scott to be more ugly politician material than contender for what I believe The Sun used to call "Page 8 Mate." Tony Mowbray has stunned star man Scott Brown by telling him he has no future at Celtic. Record Sport understands the Scotland midfielder was given the bombshell news during a showdown meeting with Mowbray before Christmas - and that the manager made it clear he hoped to sell him during the January transfer window. Brown is believed to be devastated by Mowbray's decision to ditch him - and by the fact his one-time mentor at Hibs, a man he had huge respect for, chose to jettison him during his long slog back to fitness after botched ankle surgery last summer. As ever we know not where these stories come from. Journalistic arrogance, stupidity, mischief making, wishful thinking? A previously trusted source who has a grievance against reporter, player, manager or club? Or, perhaps, it's true and Celtic are making a hollow threat to remove the public gaze from a crucial bit of January business? Any of us who have ever had any reason to read media pages or study the history of newspapers know that any of these could be reason enough for the ensuing stramash. We've all been around football long enough to know that these stories appear all the time especially in a January transfer window when much to-ing and fro-ing is being discussed but very little is actually happening. What surprises me about this is how swiftly Celtic have threatened legal action. This is a bit of tittle tattle like the hundreds of other gossip articles that appear all across the backpages and the internet every day. What makes this different? If Celtic react like this to everything that is printed there's going to be a libel lawyer in Glasgow rubbing his hands with glee. Football is surrounded by these tales but what clubs resort to legal action? I believe these things should remain private. Maybe you should ask him what was said. I have nothing more to add. That amounts to a no comment rather than a denial. Are Celtic claiming Keith Jackson made this quote up? Unpopular as journalists are, I find that unlikely. And it would make Jackson an idiot but surely not the first journalist to make up a quote by a footballer. Might we not, in fact, be justified in remembering the saga that Brown was instrumental in engineering when he left Easter Road? I've got a feeling that this story is not yet fully played out but I've little doubt that there's more chance of Gary Caldwell marrying George W Bush than there is of it reaching the law courts. I don’t know what a banana skin is, I think it’s something that’s left after you have a banana, isn’t it? Do you know what I mean? Amid this display of comic genius he also found time to contradict Mowbray on the availability or otherwise of Aiden McGeady and deny any knowledge of a "grand plan" for the Mowbray revolution (although this did raise similarities with a Josh Lyman press conference from The West Wing which deserves some credit). 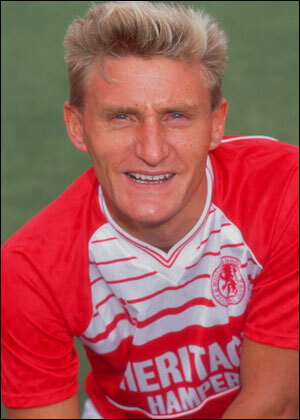 Mowbray and Venus have been stung by their early experiences at Celtic. The reasoned, articulate approach to describing their plans and aspirations doesn't really cut it in Glasgow football. So it's time for the siege mentality so favoured by Gordon Strachan. Being obstructive at a press conference, threating legal action. It all amounts to telling the media to "get tae..."
Fair enough. Maybe it's what they need to start turning things around. But all this, like tabloid transfer tales, is just froth. If the results don't change then no amount of legal grandstanding or surly press conferences will offer any respite.